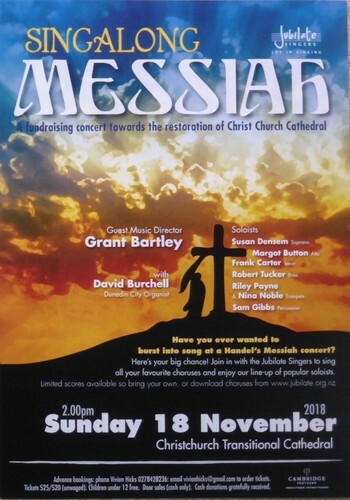 Have you ever wanted to burst into song at a Handel’s Messiah concert? Here’s your big chance! Join in with the Jubilate Singers to sing all your favourite choruses and enjoy our line-up of popular soloists. (Limited scores are available so bring your own scores, or download choruses from www.jubilate.org.nz). A Fundraising concert for the Restoration of the Christ Church Cathedral. Advance bookings: phone Vivien Hicks 0278428236: email - vivienhicks@gmail.com to order tickets. Tickets $25/$20 (unwaged). Primary children free. Door sales (cash only). Cash donations preferred.